Follow the basic Victoria sandwich recipe, replacing the caster sugar with golden caster sugar. Use 200g self raising flour (instead of 250g) and sift in ½ teaspoon ground cinnamon and ½ teaspoon ground mixed spice. Fold 50g Waitrose Ground Almonds and 1½ peeled, cored and diced dessert apples into the cake mixture at the end of Step 1. Mix 2 tablespoons demerara sugar, ½ teaspoon ground cinnamon and ½ teaspoon ground mixed spice. Toss ½ peeled, cored and thinly sliced dessert apple in the spice mixture then arrange on top of one cake and bake as directed in Step 2. 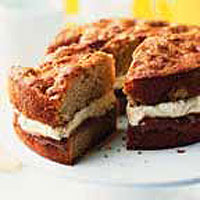 To decorate, spread 3 tablespoons Merchant Gourmet Banoffee Toffee Spread over the cooled plain cake. Top with a 200ml tub crème fraîche. Sandwich the cakes together, making sure the apple slices are on top. This cake is best eaten on the day of making. Otherwise it can be stored for 1 day in the fridge.